This is a wonderful exercise to power up and purify your Intuition instrument! Exploring the Breath Technology of Kindalini Yoga as Taught by Yogi Bhajan," page 4. Compiled by Harijot Kaur Khalsa. Published by Kundalini Research Institute, Espanola, NM 87532. Copyright 2006. Used with permission. To get your own copy, please click here. To begin, please first Sit Straight and Tune In. To learn how, please click here. 1. Sit in Easy Pose (an easy cross-legged position) and make a lotus of your hands. 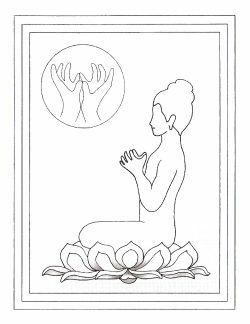 Lotus Mudra is done by touching the base of the palms together, touching the tips of the Mercury (little) fingers together, and touching the tips of the thumbs together. The other fingers gently curve and the mudra looks like an open flower. Place the mudra at the center of your chest, the heart center. The eyes are nine-tenths closed, looking at the tip of the nose. Concentrate and settle down, holding the position in silence for 2-3 minutes. Then begin to whisper the "Pavan Guru" mantra. To hear a sample of this mantra "Pavan Guru" being sung by Guru Shabd Singh, please click that tiny arrow on the left side of the bar below. It is to the right of that tiny speaker icon. "Use the force of the breath with the power of the navel... Open up the chakras (the seven areas along the spine, each with spinning "wheel-like" energy processors) with Praana, Apaana and Udyaana... Concentrate and take advantage of this time to experience the kriya (exercise)... Meditate..." Yogi Bhajan. 2. Immediately begin long, slow, deep breathing. Recharge yourself with a long, deep, slow breath with you will do consciously, paying attention to the process of filling yourself with as much breath as possible on the inhalation and fully emptying your lungs on the exhalation. 3 minutes. 3. Stay in position and begin a powerful Breath of Fire. 2 minutes. "Make the breath powerful: powrful and strong. Don't forget about Breath of Fire. It guarantees your health." Yogi Bhajan. Inhale deeply, hold the breath 10 seconds while you pump the navel point as powerfully as you can. (To "pump your navel," use your belly muscles to pull your navel back towards your spine, then release it. These pumping movements are done in quick succession.) Exhale. Repeat this breath sequence two more times and then relax. Pran Bhand Mantra. "This mantra can conquer death. It can give you the experience of deathlessness... Who so ever recites this mantra becomes absolutely divine God in action. Pavan is 'May the Force be with you.' Any woman who chants this with the beat of the navel (navel pumping) shall see change... Whoever chants this mantra will be given the seat of the Guru (that which changes dark to light), the Guru is in you. It personifies you as a Guru." Yogi Bhajan. Click here to learn how to order this CD or tape. Click here to get a video on YouTube where this mantra is sung for 8 1/2 minutes, although the mudra and procedure are different. It appears be taped at the European Yoga Festival in France, with Guru Dass Kaur leading it. Click here to get this mantra timed so that it corresponds to our 11 minutes of chanting! It was put together for us by Stephanie Brail from the YouTube video cited above! Thanks!